Earl grey too! And Lady grey. Any cup that has some freshly brewed regular ol’ tea (from tea bags). What a pretty tea cup! I like to buy them at thrift stores where sometimes I find antique cups. I recently tried Honey Vanilla Chamomile and I’m really enjoying it. Lupicia’s Apricot Tea. This company uses silk tea bags. 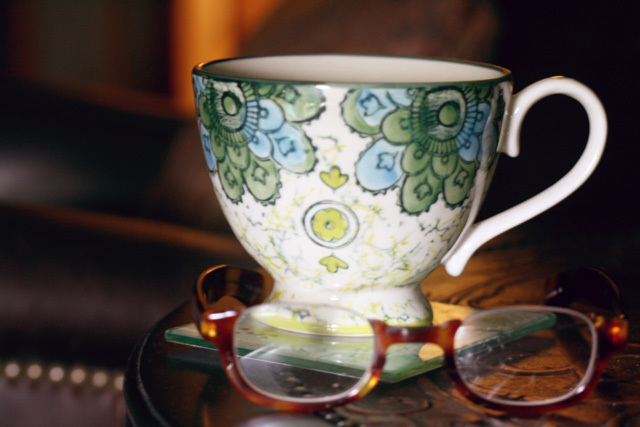 I love a thin china cup, too–though I often just microwave my water in a big old coffee mug! I have forgotten about Constant Comment—I will have to brew some! Sunshine Grey is made by Twinnings. Like Lady Grey but with a hint of Lemon. I’m off to the store today to find it! Rooibos, Earl Grey, Constant Comment, Ginger Peach from the Republic of Tea and Hot Cinnamon Spice or Holiday Tea from Harney and sons (mail order). My other new favorite “tea item” is my glass electric tea kettle that heats the water to boiling in half the time and is entertaining as the water boils in the glass pot,,,, Love it. I must check out the glass electric tea kettle…where did you find it? Who makes it? Capresso makes the tea kettle and I bought mine at Teavana but it is also sold at other department stores (like Carsons). Worth the expense if you make tea daily. Do you have the one that sits directly on the stove or the one that has its own heating element?